Our last Billy the Kid Week was last August when I celebrated the 22nd birthday of the movie Young Guns. Now, nearly a year later, it’s time for another Billy the Kid Week. This time, I am celebrating the 130th anniversary of Billy the Kid’s death. It happened this week back in 1881. This week, I’ll be reviewing various fiction/non-fiction books featuring Billy the Kid. For today, I’m beginning Billy the Kid week with a review of the comic book mini-series, Billy the Kid’s Old Timey Oddities. It was released in 2005 by Dark Horse Comics. The comic is written by Eric Powell who also writes another popular comic, The Goon. Like most of the Billy fiction I’ll read this week, this comic book assumes that Billy was not killed by Pat Garrett back in 1881. That he somehow escaped. 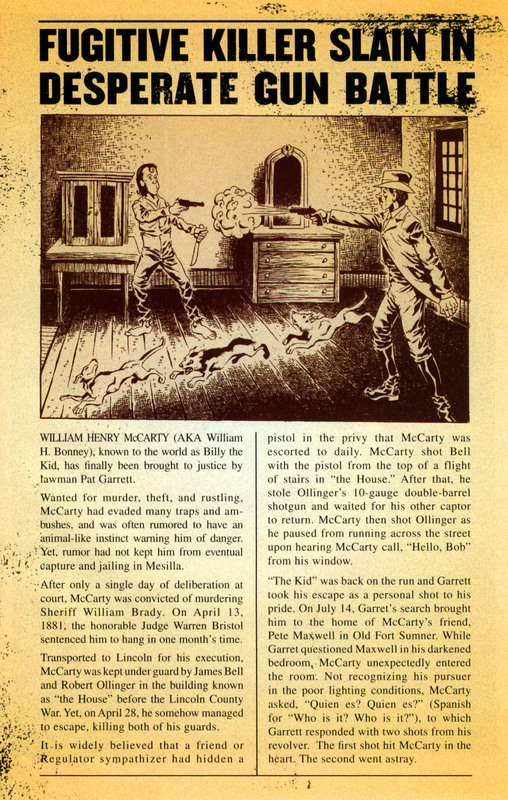 The comic starts off with a drawing of what looks like an old newspaper article talking about the chase, capture and killing of Billy the Kid (left). 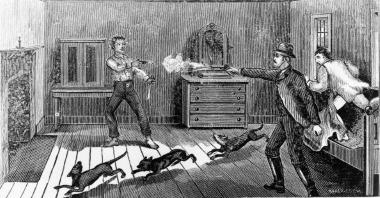 At the top of the article is an image that homages an old dime novel woodcut from 1881 called “Killing the Kid” (right). I thought, historically, that was a nice touch. Initially, we see Billy riding a train. A man named Bill Sproule approaches Billy while on the train. Of course Billy is suspicious, but Sproule offers Billy a job with his traveling circus, Bill Sproule’s Biological Curiosities. Billy is reluctant at first, but decides to go with Mr Sproule to see what the job entails. So, Billy goes to work for another guy’s traveling freak show. Now, I think it’s weird that the title of the book is Billy the Kid’s Old Timey Oddities. Like Billy owns the freak show. That’s actually what I expected. I guess not. *shrugs* Let’s press on, shall we? The traveling show is populated by a bunch of awesomely freaky characters like a tattooed lady who’s tattoos constantly change to predict the future and a wolf man. Billy is, of course, stubborn and immature. He manages to alienate all the “freaks” immediately after meeting them. Then continues to use “freak” slurs when describing them. At first, it’s irritating. Billy just seems like a mean douche. But as the story goes on, Billy’s edge softens a bit and he helps the group when they get in trouble. And they do get in trouble. The group goes looking for a jewel called The Golem’s Heart. It is owned by none other than Dr Victor Frankenstein. So the group goes after it and immediately becomes trapped by the mad doctor. The doctor has been performing ghastly medical experiments on the people in the surrounding town. He plans on using the freaks in some of these experiments. I love the depiction of Victor Frankenstein in this book (pic on left). 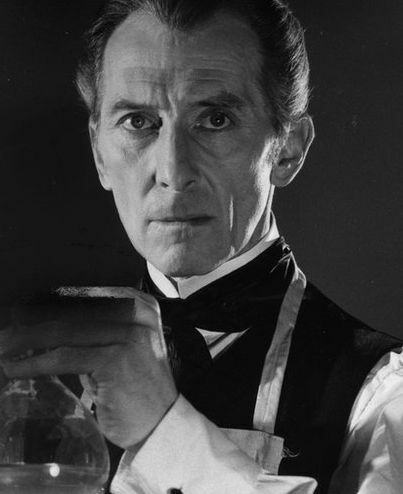 It’s eerily close to Peter Cushing, who portrayed Victor Frankenstein in a bunch of movies for Hammer Films in the ’70s (pic on right). Just a really nice touch by the artist. So Victor traps all of the group in his castle and plans to do horrible, horrible experiments on them. Billy becomes locked in a chest but escapes and helps the group overcome and defeat Frankenstein. They manage to turn Frankenstein’s mutated creations back on him. It’s a pretty good book. I enjoyed the majority of it and the artwork is perfect for the story. It reminds me of some of the early EC work in Vault of Horror or Tales from the Crypt. Very cool. I can honestly recommend it to people wanting a nice, quick, fun read. 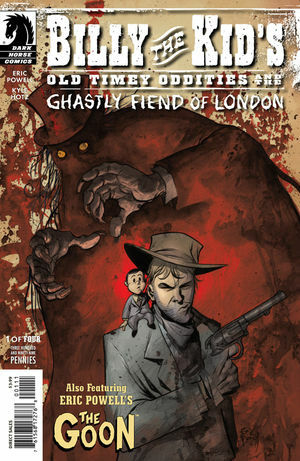 Last year, Dark Horse released a sequel called Billy the Kid’s Old Timey Oddities and the Ghastly Fiend of London (that’s a lot of title to type). However, I was not able to track down a copy to read, but it looks pretty awesome. It looks like a Billy the Kid and freaks vs Jack the Ripper. When I finally get a copy, I’ll put up a review. It seems Powell is including his other comic creation, The Goon, as a backup feature to this second volume of Billy the Kid’s Old Timey Oddities. I look forward to reading this. Stay tuned, this week on the Cavalcade is full of Billy the Kid as we lead up to the 130th anniversary of the outlaw’s death on Thursday. 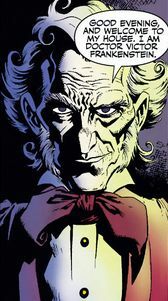 This entry was posted on July 11, 2011 at 8:00 am and is filed under Billy the Kid, comic books, Frankenstein, monsters, reviews with tags Billy the Kid, Billy the Kid Week, comic books, Frankenstein, monsters, reviews. You can follow any responses to this entry through the RSS 2.0 feed. You can skip to the end and leave a response. Pinging is currently not allowed. I read one issue of the Ghastly Fiend of London awhile back. It was quirky, but not enough to hold my interest… this original series sounds pretty freaking cool, though! Would you recommend it? It’s quirky also. I do recommend it. It’s not just blow you away awesome, but it’s fun.